Our “Mission Statement” (which we came up with when asked years ago) is “Unity and community”. We feel that sums us up really! We are a small church where members come from different church traditions but feel comfortable together in worship. 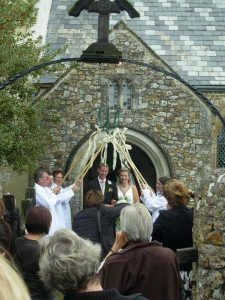 There are close ties to neighbours and friends in the village, our churchyard contains many old friends who we no longer see but fondly remember. In addition to marking the Christmas and Easter Festivals we have a Harvest weekend in September: starting with a Harvest Supper on the Friday (a shared Village Hall/Church activity); followed on Saturday by a church sponsored Harvest Show of fruit, vegetables, home baked & bottled goods and a variety of crafts; the weekend finishes with a joyful Harvest Festival Service on the Sunday. In May we have the opposite to Harvest – Rogation! 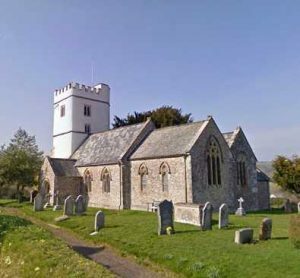 We enjoy (along with other churches and the Methodist Chapel) visiting fields and pastures with prayers, readings and singing, followed by a Devon farmhouse tea for all to get together. 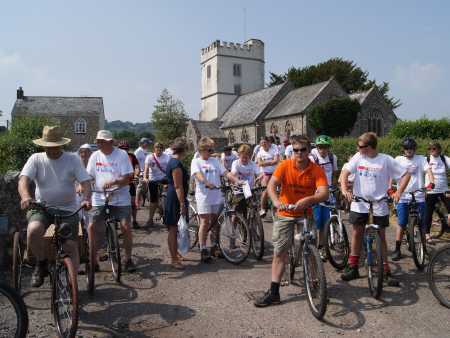 We continue to hold a Charity Bike Ride and barbeque in the summer to raise funds for a chosen charity (in 2018 it was Honiton’s Admiral Nurse) and families enjoy this event. The church is normally open to visitors during daylight hours. Northleigh village website has useful information, including about the church.